Sun Bingo is not your standard variety online bingo site. They are one of the biggest and most popular sites for UK bingo players. If you are looking for a top notch UK bingo site, than we suggest that you click over to this site today. Sun Bingo UK is the home of Britain’s favorite online bingo game. Established in January 2006, Sun Bingo UK has quickly grown to become one of the biggest UK bingo websites. They have thousands of registered members and give away millions of pounds in jackpot cash prizes every month. This site offers Bingo 90, Bingo 80 and Bingo 75 games. they’re the number one place to play online bingo. They’ve got fantastic bonuses, great bingo games, free offers, and the biggest bingo jackpots online. They’ve teamed up with one of the UK’s leading and established online gaming companies – Gamesys. Gamesys have built a bespoke bingo product with all your favorite bingo games plus new exciting and exclusive games that can only be found at Sun Bingo. All bingo players can safely transact on their site in confidence knowing that their transactions and personal account information is protected by 128-bit encryption, provided by Thawte Security. All credit card details are stored on servers protected by the latest firewall security to prevent unauthorized access. Play online bingo today at SunBingo. This UK Bingo site is committed to providing its members with a responsible gaming service. To ensure Sun Bingo players enjoy their online experience and play sensibly they provide a variety of player protection tools. In their ongoing efforts to assist with problem gambling they work closely with the leading UK self-help organizations and they support The Responsibility in Gambling Trust (RIGT) which is instrumental in coordinating and funding research into both the prevention and support of problem gamblers. You can play their award-winning games from as little as 5p, and if you join today, they will match your first deposit up to £200! With regular promotions, friendly chat rooms and big cash prizes up for grabs why wait to join in the fun? Now you can play at your favorite online bingo site on the go. SunBingo is now mobile so you can get your bingo fix anywhere and anytime as long as you are on a smart phone and have an internet connection. If you are looking for some amazing slots games than check out the offerings here. There are of choices including; Double Bubble, Mystic Meg, Red Carpet Richez, Triple Win Cafe and many more. You also have the choice of fun play so you can check out these awesome slots games for free. 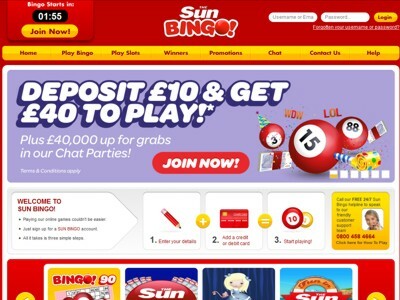 Sun Bingo is ranked number nine on our top 10 bingo site ranking list. You can learn more about our top sites by reading our article Top 10 Bingo Sites 2015. Sun Bingo is no longer endorsed by bingoguy. If you are looking for a great place to play UK bingo then we suggest that you check out our Tasty Bingo Review. This bingo site has been tested, reviewed and approved. You are guaranteed to find friendly chatrooms and big cash prizes up for grabs! Deposit £10 and get £40 to play with the amazing 300% Welcome Bonus SunBingo.co.uk. For big fun and big prizes, as well as some free bingo thrown in, choose Sun Bingo.